Certainly a lack of resonance CV out there. The VCA with plenty of stages is a good idea, only experience of that so far is the dual series VCAs in the Erica Polivoks "improved" VCA clone. That sums the output of two VCAs rather than sums the CV to affect a single VCA. That VCA looks good, its on my list. The ergonomics of the whole series looks good to. what's the HP on these bad boys? I always thought the SE1 sounded great, not sure why i never hung onto one... i guess the 4089 and AMP would give you a lot of that sound? 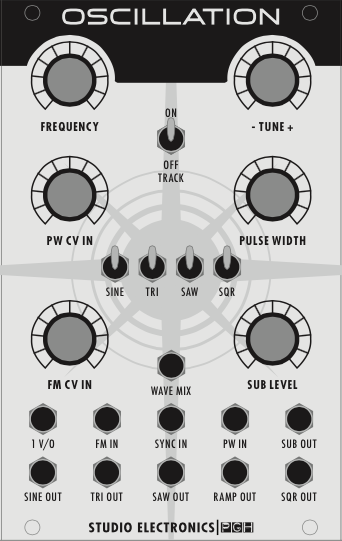 I sold my Macbeth Backend recently, a great module but i only really needed/wanted the filter and to a lesser degree the vca, so maybe this will cover some of that territory? these modules have a Pittsburgh Modular logo on them right next to the SE logo. Looks like it is a collaboration. It is - this was documented elsewhere on this forum. I am not sure exactly what role Pittsburgh is playing, however. yes it is a collaboration born out of NAMM meet up. There is a youtube video with details. I think what it is is that Pittsburgh is making them circuit boards, face plates etc in the far east but components are hand loaded in CA. Whoever wrote the product descriptions for these modules should get some kind of award. Never thought that I'd be tempted to buy an SE filter clone module. 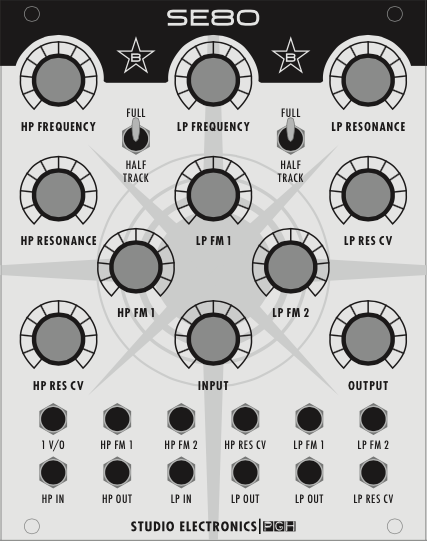 Looks like all boomstars will be ported to eurorack. As well as individual modules 2 customizable systems are available. Midi 6hp, Oscillation (x2) 32hp, Filter (not SE80) 12hp, Multiple 2hp, Levels 10hp, Sci-Fy 10hp, Shapers 12hp, AMP 8hp, LFO 6hp, Outs 6hp. The Midi module, LFO Module, Outs Module, and multiple module are still in development. Let's say you have a one-voice skiff, and this is the sole amp. The patch you have in mind has dynamics, but you also want a touch of tremolo. The first "stage" shapes the amplitude/dynamics of the sound as you would imagine, the second can be used to create tremolo. Why wouldn't you just mix the two CVs in a DC mixer and use one VCA? Well... I always hook up velocity to my vca's and this would save a step that keeps a mixer free to do other duties. Having an extra pot to dial in my velocity level if very helpful to me. Then again it would have been nice to have a switch to enable parallel vac's for stereo. I'm pretty excited for these. I don't have a lot of filter clones but have eyed the boomstar synths in the past, mostly wishing they would bring their filters to euro, which they have here. I would be most interested in a SEM type filter. 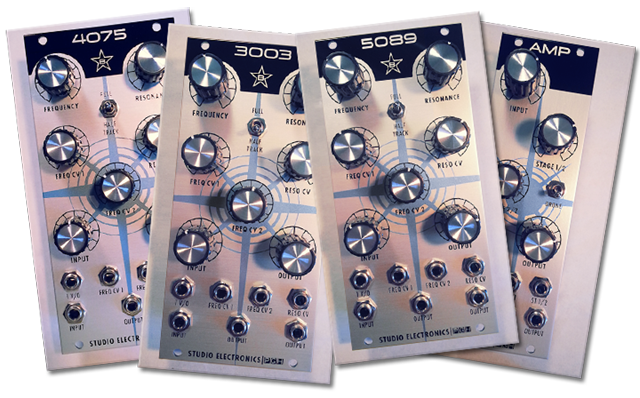 Apparently, these are the first in an entire series of modules based upon the Boomstar circuits. SE is showing the whole thing at 2015 NAMM. At least 11 modules. Does anyone know where they will be at NAMM? Or have hints at the rest of the 11 modules, of course? I'll try to find this. Interestingly, Rich and I also met at NAMM last year and are showing our (Tipsy Circuit's) first module this year at the Muff Wiggler booth (#1371), so one could say that our is also a collaboration born out of meeting at NAMM. Can someone explain the stage inputs on Amp? From what I can tell, it's two amps arranged in series, with two CV inputs to control either. Let's say you have a one-voice skiff, and this is the sole amp. The patch you have in mind has dynamics, but you also want a touch of tremolo. The first "stage" shapes the amplitude/dynamics of the sound as you would imagine, the second can be used to create tremolo. Or, replace tremolo with a velocity voltage from a MIDI/CV converter, and you have a an all-in-one amp with velocity. I could be completely wrong, however. Bob, this superb copy belongs in the BM Manual! Care to donate it?ÃƒÂ¢Ã¢â€šÂ¬Ã¢â‚¬Âwith attribution of course. Let's try that again. Selador, this superb copy... Like that montage Bob. Cool toning. Sure! No problem, go for it. THey look great.. I have some of their stand alone synths and they are great..
the discrete, cascaded AMP is certainly first on my list. Thanks Bob, but isn't the copy Selador's handiwork? Huh? What I did was a heavily photoshopped the version that was on the Matrixsynth website, I wasn't aware who took the photos.